These Mini Bacon Cheeseburgers are perfect for your next game day get-together, cookout or family gathering. Happy National Cheeseburger Day 🍔! I can't think of a more delicious day than today. 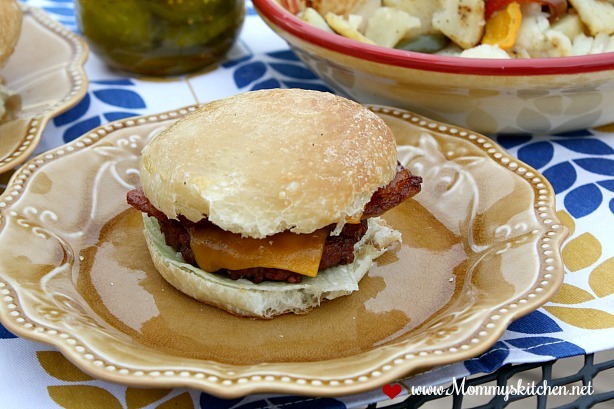 Last weekend I made these grilled Mini Bacon Cheeseburgers for a quick and easy meal. These tasty little burgers are a mini version of America's favorite burger. This recipe makes a dozen burgers, which are perfect for cookouts, game day get-to-gethers, family gatherings or parties. At first glance you wouldn't think these little bacon-cheeseburgers are filling, but surprisingly they're just as filling as a full size cheeseburger. Top these delicious little burgers with cheddar or American cheese, crispy bacon and all your favorite hamburger toppings. Pair with with french fries or grilled potatoes and peppers like we did. 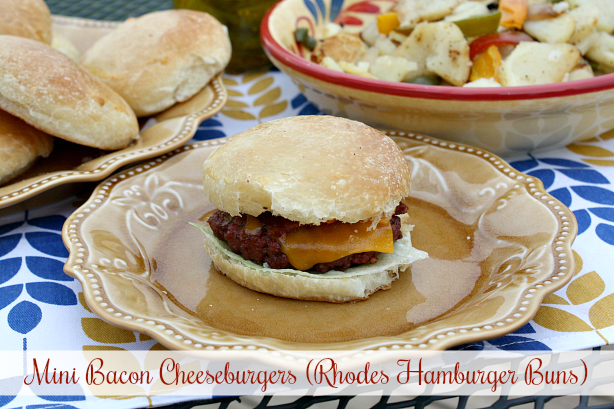 This easy burger recipe starts with these mini hamburger buns that I made using Rhodes Frozen Dinner Rolls. You can customize these hamburger bun any way you like. Large or small, with or without sesame seeds, They're that easy! 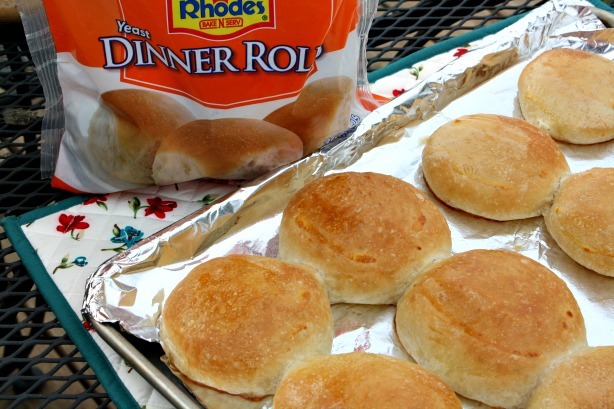 To make things even simpler use, Rhodes Warm-N-Serve Rolls which bake up in minutes. My grocery store doesn't carry these yet, but you can bet as soon as I see them, I will be stocking up on several bags bags for quick and easy lunch and dinner sandwiches. I've included some step-by-step instructions to show you how easy these Mini Hamburger Buns came together, so let's get started! First place 12 dinner rolls on a large baking sheet that has been sprayed with non-stick spray. Leave the rolls at room temperature until the rolls are thawed, but still cold. Using a small rolling pin or your hand, flatten each thawed roll into a 2 1/2 inch disc. Let the rolls rise until double in size (about 3 hours). Combine the egg and water and brush the egg wash onto each flattened roll. Sprinkle on sesame seeds (optional). Preheat oven to 350 degrees. 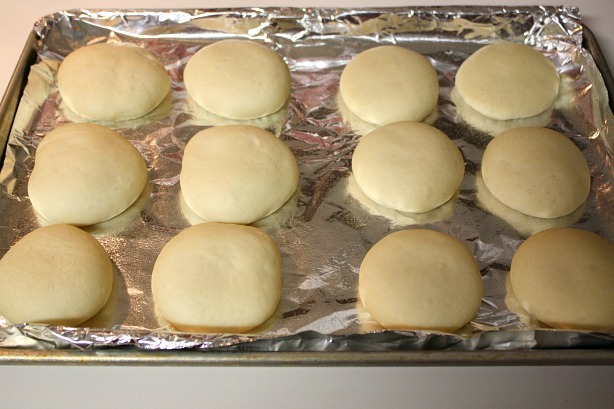 Bake the rolls for 12 - 15 minutes or until golden brown. 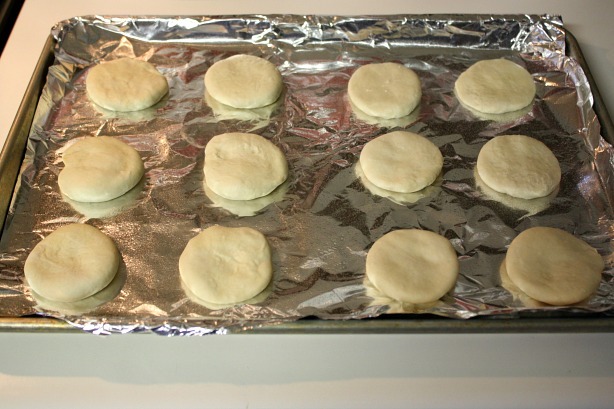 Remove buns from oven and cool. Slice in half for hamburgers and set aside. Prepare and assemble the hamburger patties, bacon and outdoor or indoor grill. Place one mini grilled hamburger on each bun and add cheddar or American cheese, crispy bacon and your favorite hamburger toppings. 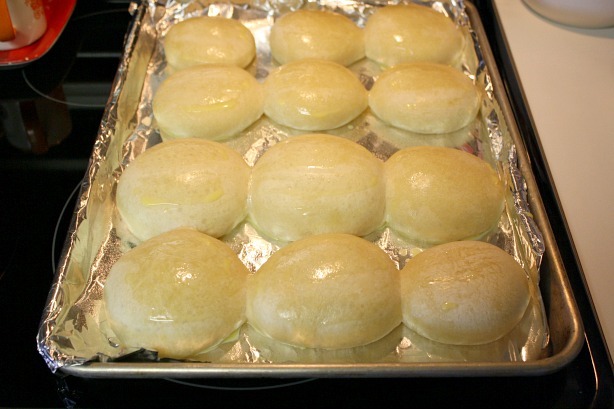 Place 12 dinner rolls on a large baking sheet that has been sprayed with non-stick spray. Leave the rolls at room temperature until the rolls are thawed, but still cold. Using a small rolling pin or your hand, flatten each thawed roll into a 2 1/ inch disc. Let the rolls rise until double in size (about 3 hours). Combine the egg and water and brush the egg wash onto each flattened roll. Sprinkle on sesame seeds if using. In a large bowl combine, ground beef, Worcestershire sauce and seasonings. Lightly mix to combine. Form into 12 mini patties about 2 1/2 - 3 inches in diameter. Grill the patties on a grill or in a non-stick skillet over med-high heat until done. Add a slice of cheddar cheese over each hamburger and cook an additional 2 minutes before removing so the cheese melts. 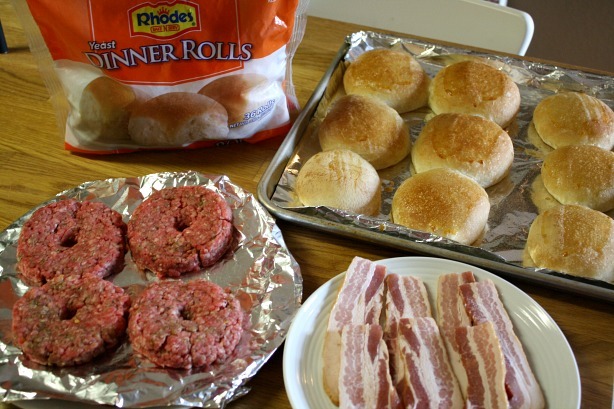 Place mini hamburgers on each bun and add cheddar cheese, bacon and your favorite hamburger toppings. • These are amazing, can’t wait to make and eat them! !